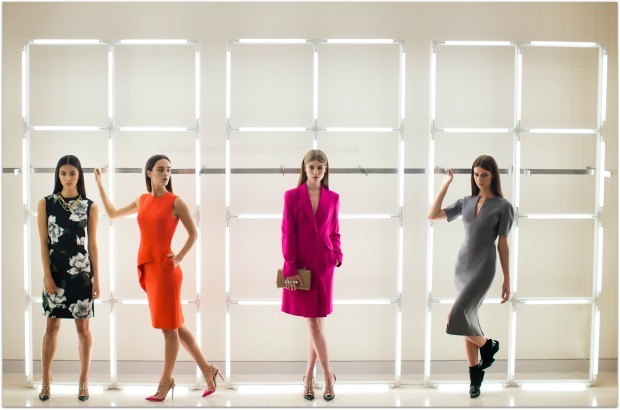 Brown Thomas is Ireland’s most luxe department store, so it’s no surprise that its catwalk shows are a glittering highlight of the fashion calendar. The AW13 collections showcased last week and the event was as good and as great as anticipated, as the store unveiled the key trends that will be shaping our new season wardrobes. The show featured more than 100 looks from designers including Lanvin, Prada, Dior, McQueen, Victoria Beckham and Stella McCartney. Key trends included The Lady – inspired by Hitchcock’s Femme Fatales – along with punk meets grunge, minimalism, and boy meets girl. And where high fashion leads, the high street follows - so what should we look out for in Topshop, River Island et al in the coming months? Cocoon shapes, strong shoulders and cinched in waists are all bang on trend. Oh, and tartan – lots and lots of tartan. But we knew that one already. Gotta say, I’m excited for autumn! Who’s with me? How cute is that Stella dress? Adorable. That was my favourite look Roxy! I remember visiting Brown Thomas the one time I visited Dublin. I honestly could have spent my whole visit in there if only Ian hadn't dragged me out!!!! It's wonderful, isn't it? I honestly have lost full days in store (the cocktails in the restaurant helped with that!). When I was a student, I was afraid to go into Brown Thomas, I thought they would know I couldn't afford anything and kick me out. I'm braver now, I just go in to touch all the pretty things. When I buy something I get that smug feeling, like when you win an argument. Weird, I know. Ah I love BTs. Can't afford anything past their makeup hall though!! @ahsuretislovely, I used to feel the exact same way. I still remember how I felt on my first beauty spree in the store. I bought Clarins Beuaty Flash Balm, YSL Touche Eclat and a Chanel nail polish. An obsession was born! They do such a good job. I heart Stella.